Enjoy the magic of the HBH-DS980's OLED display as well as superb wireless audio quality. Wirelessly connect to your phone, PDA, laptop, or wherever you've saved the music you want to hear. High-quality components, technology and design make for high quality sound. Enjoy music and conversations in superb clarity. Neat and discreet-How you communicate reflects who you are. The hidden depths of a mirrored OLED display illuminates the information you need while you stay mobile. Digital Signal Processing-Enhanced audio quality is achieved through Digital Signal Processing (DSP) technology, including compression and echo cancellation. Multipoint-Connect to two wireless devices simultaneously, allowing access to the music files in your computer, PDA or other Bluetooth?-equipped devices. Adaptive Frequency Hopping (AFH)-AFH reduces the impact of interference between wireless technologies, resulting in excellent audio quality. Based on the other reviews, I was ready to be impressed with this headset. I tried to keep an open mind, but I've had enough. I know a lot of people like noise isolating gel earbuds to get better sound, but I hate those. I want to be able to hear a car horn or a person's voice around me. The sound quality was excellent for a few seconds, but I had to keep pushing the buds deeper in my ears, otherwise they would wiggle out and sound tinny. The bluetooth functions were great, but if you move around, the signal drops out. Well, even when I was sitting still on the beach, the signal would drop out and the music would skip. Worst of all, the first unit I had died after about two weeks. I returned it for a replacement, thinking I got a dud. The second one died after a week and a half. The battery was charged, the music was playing, a buzzing chirping noise came through the buds, and then it was completely dead. I couldn't power it up, recharge it or reset it according to the instruction manual. I just sent my second one back for a full refund. Great Buy! Definitely worth the money. All I can say is...great job Sony! The pros of the headset go above and beyond. I purchased this unit to use with my Nokia N95-8GB and they work great. 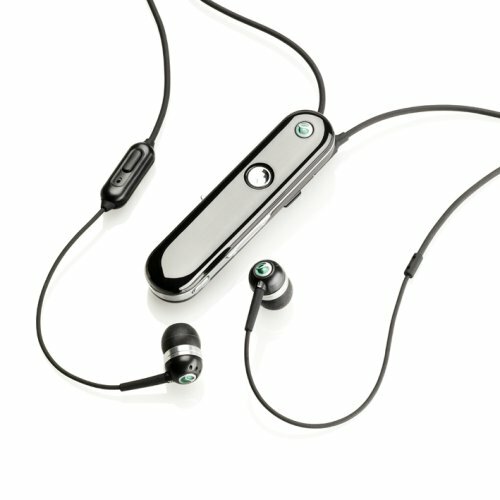 The sound quality is wonderful and the comfort of the buds make it easy listening to music for long periods of time. The bass is deep and rich and the clarity is great. No fuzzy radio type signals. Although you need to remember that the buds will only sound as good as the source of the signal. Meaning that if you have a crappy phone and a crappy signal you will get crappy results. The cons are just like any headset. The battery life could be better (about 8 hours of straight use) and the mic and talk button is on the left side bud and not the right (personal preference). Every now and again you do get a slight disruption (again its only good as the signal) and the lack of the ability to use its full functionality on NON-Sony Ericsson Phones is definitely something of a nuisance. This is a great bluetooth if you want stereo for music or for conversations in loud places. Whenever I had trouble hearing I use both buds. It blocks out background sound so I can hear fine and the mic is so good it only picks up my voice (as long as the volume isn't set too loud). Worst case in really loud environments I have to hold the mic near my mouth. Sometimes I use it at work just to block out loud sounds. Works just as goood as the earplugs we use hear and Thy're easier to put on and take off. It's great for me because I don't like to walk around with a device in my ear or have to explain to people that I'm on the phone and not talking to them. Also, If your driving you don't have to fumble around to look for it because it just hangs on your neck. Works great with my Sony Ericson W580i and my bluetooth laptop. It accesses phone contact book and recent calls or music playing. Displays time too. One button music play, one button phone answer with caller ID. name shows just like you have it saved on your phone. It would be nice if I could plug in another set of head phones. Actually I really want to plug into my home theater so I can remotely send the music from my phone. -Stereo sound is great when connected to compatible bluetooth-enabled devices. -Can be used as either cell. phone headset or stereo headphone. -DC connector is not the standard mini-USB, Sony intentionally uses some weird connector here, so you better not lose your wall charger, or else...$$$. I wish I had known about this... Be warned! -High price compare to others. So far i have been able to pair it with my Fujitsu P1610 (excellent sound), USB BT dongles from MSI StarKey 2.0 (great stereo sound) and Anycom USB-250 (so so sound). Clearly, sound quality is dictated by what you connected to, the Sony HBH-DS980 only streams what coming out from your devices. I would give it 4 1/2 stars if it had had a std. mini USB connector. This is the first BT headset that I bought. I bought this mainly to pair with my SE K800i for compatibility purposes. So far, I love the sound. It lacks a bit of bass and also the battery life could be better for sure. If you have a SE cellphone, the charger works for your phone as well (just an FYI) I think some people might not know that. This is a plus for me mainly because I wouldn't have to carry 2 charges if/when i'm traveling. The other pins are for music/functionality (radio) stuff for your wired headset. Sony makes listening to music and taking calls a quality experience with the Stereo Bluetooth Headset HBH-DS980. The stylish accessory delivers wireless music and calls with superior sound performance, even in noisy environments. Connect it to 9 devices and it automatically pause your music to accept a call from your mobile with caller ID. Digital noise cancellation/echo reduction to reduce background noise is a huge plus with this headset. Bluetooth 2.0 to deliver better quality voice calls. A2DP (Advanced Audio Distribution Profile) for high quality sound when listening to music on your mobile phone, PC or any portable device. A hidden OLED display delivers a seamless design effect, much brighter than a conventional LCD display. I paired my set with my Vista Ultimate PC and started the MS Speech Recognition, trained the PC and its working like a charm. It even control all my audio and video software on my PC. (RealPlayer, Win Media Player, JetAudio are the audio players tested and for video Cyber Link power DVD and Power Cinema.) This Set is like a chain around my neck. I'll pile on with praise of this unit. I have owned it for over a year and love it. I have used it to pair with Windows Mobile devices (HTC TYTN, HTC TYTN2 a.k.a. AT&T Tilt, HTC Touch Pro) and have found the pairing process to be quick and painless. A2DP remote audio controls work great. I do not have any issues with the wires getting tangled (which happens a lot with other headsets) as the wires are nice and thick. Sound reproduction is very good, considering you are receiving a compressed audio signal over the air (Hifi purists won't be satisfied, but they beat my Sennheiser MX-90 in-ear headphones especially in the upper end). The volume level is good, not great. If you think the audio quality isn't that good, try another size of earpad (it comes with three sizes). Biggest complaint is the proprietary charger, as has been said before. Also the medallion itself could be a little smaller. These are minor quibbles. Great device, small flaws, USES Any SE charger! Small flaws tarnish this great product. I used this with a SE Z750 debranded and loaded with updated firmware from SE. Edit: I just discovered that my SE Z750 charger (wall or car charger), charges this BT device! YAY! I only need ONE charger with me when I travel. Other posts elsewhere show that this is the same for other SE phone models, you can use the same SE charger with the device! Well, I've always hated those Borg-like (or Uhuru-ish) ear clips for Bluetooth. They scream-- I'm so important that I must be connected all the time... Another problem with them is that it's very hard to tell WHO it is on the other end. And why would you want to put a RF device in your ear (not that I'm saying its harmful, but...). And then you have to pull them out to listen in Stereo to your music or podcast or if you have the service, the audio stream of your cell's TV/Video cast. Sony has come very close to solving these issues with the HBH-DS980. This Bluetooth stereo device will allow you listen to a music/sound source while keeping you connected to your phone for calls. It could be the same device or it could be a different device. As I write this I'm listening to iTunes on my laptop (networked iTunes library) and connected to my cell phone. The unit has a lightweight forefinger length control unit that hangs off of a neck string, so that you can pop the ear buds out and still wear the device, ear buds dangling. The length of the ear bud's cords can be adjusted so you won't have big loops of wire hanging. The entire thing could be tucked into a shirt pocket as you wear it, if you don't want it dangling and people will assume you have some sort of mini-player in your pocket. There is a 'safety release' in the connectors that hold the ear bud wires if someone (small child?) pulls on the unit. The extra feature that makes this better than some other units is that the display is full featured and goes beyond just a few icons to twenty pictograms plus text for caller id and music track information. Normally invisible the display on an incoming call it lights up with the caller id information. So now, you can accept/reject the call if you wish. Either press the 'call button' on the microphone bulge that hangs closer to your jaw line and the unit will pickup the call, and blank out the music automatically. Reject the call by holding the button down. A mellow beep or the phone's ringtone can announce the call and a beep tells you that the rejection went through. You can interrupt the music to make a call also by pressing the Call button. The OLED on the unit will also display the ID information of the track you're listening to - provided your Bluetooth sending device supports that information which is NOT available as just a stereo headset. It must support the more advanced headset profile A2DP or Audio Gateway. Along with a volume graph (different settings for music and cell phones allowed), time, battery power, the devices that you are sync'd to, and were sync'd to in the past. However, the OLED is not bright enough for direct sunlight - small flaw. The 980 is also a remote control device. It has a dedicated Menu button that allows you to view the `Contacts List', `Call List' and `Device List' (and back up a level when using these lists). Using the rocker volume bar allows you to highlight these items and the Play/Stop button is also the 'Select' in this function. This works fine when your phone is the primary device. Sometimes the unit when connected to the laptop (in my case) disconnects from the phone. The call/contact list icons show, but as the phone is not primary there is nothing to display. Holding down the on/off button or the Call/Talk button will resync you to the primary device (more later). But you may not realize that you are disconnected. Another small flaw. The manual says that you can easily transfer any call in progress on your phone to the headset by `pressing the Call button' which may be a SE phone feature. Besides the manual method to either retrieve a recent call or dial one from your contact list (contact list is divided into alphabet; select a letter and scroll through listings with multiple numbers listed for each contact as they scroll by and can be selected with the Play/Stop button); you can also use voice dialing if your phone supports it. (Voice dialing on your phone will NOT negate the need to use the call button. Some phones support 'Call Control' by saying 'answer' or 'busy' and never have to move your hands. Magic Word (turn on the phone's voice command) and Voice Call Control however, doesn't appear to work with the unit, as it will not leave the microphone open all the time as it's a battery drainer. In my configuration, I could only press the Call button and then my phone would beep (in my ear) for the voice number that I recorded for each number. The OLED shows a dialog balloon pictograph as it waits for the voice command. This could be a problem for some but, magic word is a battery drainer for your phone. It would be highly recommended that you use the device to RECORD the voice commands for better matching. The Device List will also to allow you to connect to the additional devices. Select the previously paired device from the list and press the Play/Stop button and the `reconnecting Bluetooth' display will show. Adding a new device requires that the 980 be turned off, and then holding the on button until the `search for devices' pictogram shows. The unit supports auto-pairing, and if you're connecting device doesn't-- the pair code is the expected `0000'. Reconnecting or adding a device paired previously is done by the list and pressing the Play button until a reconnect icon appears. A problem exists where your phone and the unit will not always agree on what is connected all the time. Your phone might say it's not, and the unit may say that it is. Selecting a device that the 980 already thinks is connected won't show the `reconnecting' display. Either turning the unit on and off will resync the primary device or pressing the call button will resync, but you'll have to reselect the secondary devices. The unit can handle 'call waiting' by using the Call button as a flash button. Three different sized sets of silicon buds are supplied to give a good fit, you should be able to wash with soap and water. I found the headphones clear and bright sounding. 192bps media sounded very very good playing from my phone. I mentioned before that it can hold an independent volume setting for music vs. voice calls. The unit has independent Play/Stop, volume +/- rocker, Menu buttons and a skip/back slider. When connected to my SE phone; the Play buttons will startup or the media player at the last song in your playlist. You can scroll through the current playlist but you can not change playlists. Also, the data for the music id on the unit is dependent on the software being used on the player and the Bluetooth profile being used. Right now, I don't have a Bluetooth profile beyond 'Headset (aka earphones and mic)' and stereo headset on the Bluetooth on my PC. So I am not seeing music information on the 980's display. The PC's `Audio Gateway' profile which `should' be valid is not working on the 980 and won't recognize it as a service beyond just headphones (but the Next/Previous buttons do work). My phone has a more sophisticated profile and it shows the data. I can however, go to the next/previous item in the current playlists on both my phone and iTunes. Unit makes beeping noise and will (on my phone's display anyway) show `Battery Low on Headset" message. Really low battery will just shut the unit down; I got an hour of music playing after the first low battery message. I think the proprietary charger connection is a plus. There is no question that the unit is correctly connected and the prong snaps into the units body. OLED lights up with animated charge pictogram. Additional flaw: time display is 24hr there doesn't seem to be way to change it. My phone is set to 12hr AM/PM. It would have been a big plus to be able to use your own headsets but then the mic would have to be in the unit, and that would have to be near your head. Replacement silicon buds are 3 sets for $5 at some online sellers. Plus $5 shipping. I hope that there is a firmware upgrade for this unit, the small flaws can add up to be annoyances for some, and it should all be `correctable' SE might update the firmware, they do for their phones. Edit: I spoke with SE about some issues with the device, they don't expect to have a firmware update. One issue not mentioned is that the unit's display goes 'nuts' once in a while, and looks like static. Functionality is still there, you don't have a readable display. A full reset will correct this, it's described in the manual, shut off, hold call and menu buttons down together, and turn on, device will reset and correct it. Also, you can setup your bluetooth profile in the phone to auto-answer calls without pressing the call/mic button. My SE phone switches profiles when it detects that the 980 is in range automatically and transfers audio to the phone. 1. Nice design. Very stylish and sleek. 3. The range is farther than what they say it does (at least for me). 4. Cool screen which displays Song playing and Who's calling. 5. Sony customer service is pretty descent. My piece died all of the sudden. It would not turn on or charge up. They are sending me a new piece. 1. Battery does not last that long. It gives you about 3 hours of music playback. I do not talk that much on the phone so no comment on talk time. 3. The face is too flashy for my taste. I wish it had a more matted finish. Hope this was helpful. Do your research, Peeps!